It's really common to see claims that some meme is backed by “studies” or “science”. But when I look at the actual studies, it usually turns out that the data are opposed to the claim. Here are the last few instances of this that I've run across. The pop-sci version of Dunning-Kruger is that, the less someone knows about a subject, the more they think they know. 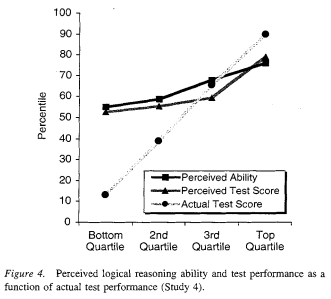 The actual claim Dunning and Kruger make is much weaker. The original paper isn't much longer than most of the incorrect pop-sci treatments of the paper, and we can get pretty good idea of the claims by looking at the four figures included in the paper. 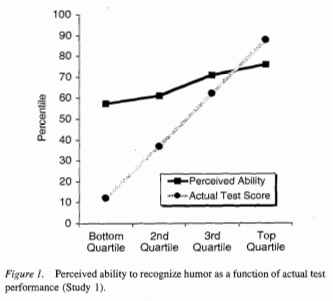 In the graphs below, “perceived ability” is a subjective self rating, and “actual ability” is the result of a test. 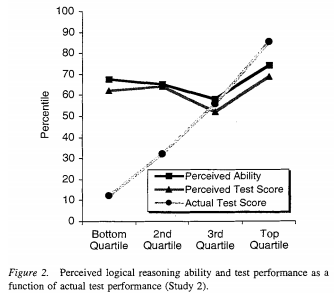 In two of the four cases, there's an obvious positive correlation between perceived skill and actual skill, which is the opposite of the pop-sci conception of Dunning-Kruger. A plausible explanation of why perceived skill is compressed, especially at the low end, is that few people want to rate themselves as below average or as the absolute best. In the other two cases, the correlation is very close to zero. It could be that the effect is different for different tasks, or it could be just that the sample size is small and that the differences between the different tasks is noise. It could also be that the effect comes from the specific population sampled (students at Cornell, who are probably actually above average in many respects). 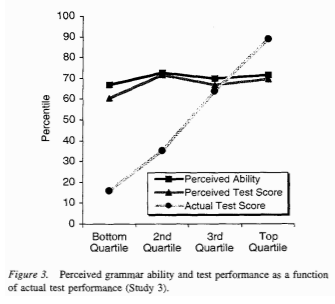 If you look up Dunning-Kruger on Wikipedia, it claims that a replication of Dunning-Kruger on East Asians shows the opposite result (perceived skill is lower than actual skill, and the greater the skill, the greater the difference), and that the effect is possibly just an artifact of American culture, but the citation is actually a link to an editorial which mentions a meta analysis on East Asian confidence, so that might be another example of a false citation. Or maybe it's just a link to the wrong source. In any case, the effect certainly isn't that the more people know, the less they think they know. It's become common knowledge that money doesn't make people happy. How much is enough depends on who you ask, but $10k/year, $30k/year, $40k/year and $75k/year are all commonly named numbers. As of this writing, Google says that magic number is $75k/year. Not only is that wrong, the wrongness is robust across every country studied, too. 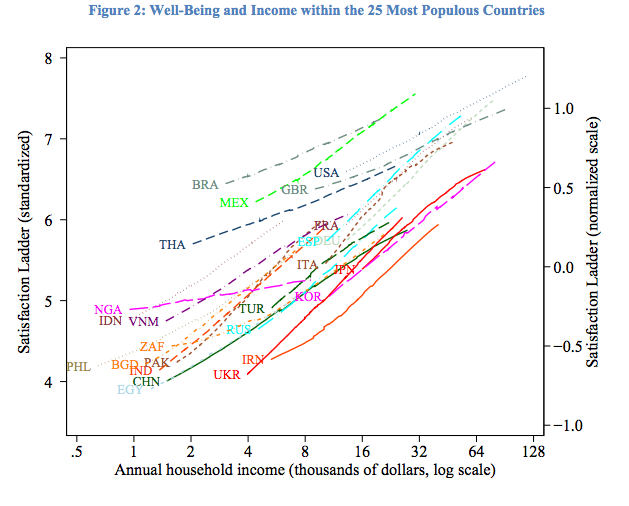 That happiness is correlated with income doesn't come from cherry picking one study. That result holds across five iterations of the World Values Survey (1981-1984, 1989-1993, 1994-1999, 2000-2004, and 2005-2009), three iterations of the Pew Global Attitudes Survey (2002, 2007, 2010), five iterations of the International Social Survey Program (1991, 1998, 2001, 2007, 2008), and a large scale Gallup survey. The graph above has income on a log scale, if you pick a country and graph the results on a linear scale, you get something like this. 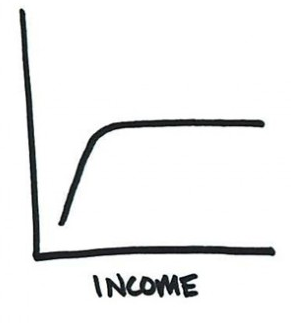 That's an actual graph from an article that claims that income doesn't make people happy. These vaguely log-like graphs that level off are really common. 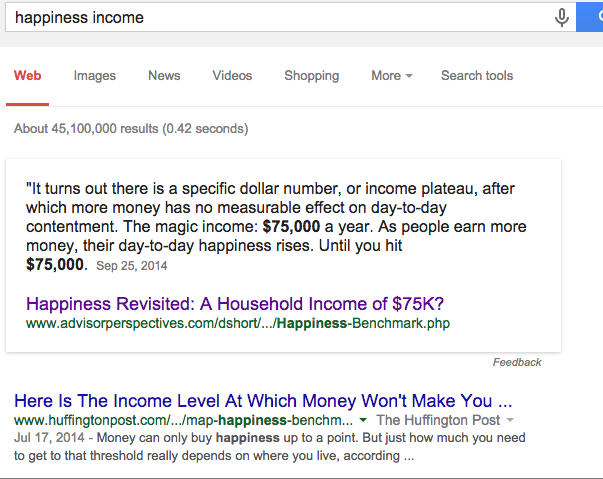 If you want to see more of these, try an image search for “happiness income”. My favorite is the one where people who make enough money literally hit the top of the scale. Apparently, there's a dollar value which not only makes you happy, it makes you as happy as it is possible for humans to be. As with Dunning-Kruger, you can look at the graphs in the papers to see what's going on. It's a little easier to see why people would pass along the wrong story here, since it's easy to misinterpret the data when it's plotted against a linear scale, but it's still pretty easy to see what's going on by taking a peek at the actual studies. The idea that people bounce back from setbacks (as well as positive events) and return to a fixed level of happiness entered the popular consciousness after Daniel Gilbert wrote about it in a popular book. But even without looking at the literature on adaptation to adverse events, the previous section on wealth should cast some doubt on this. If people rebound from both bad events and good, how is it that making more money causes people to be happier? Turns out, the idea that people adapt to negative events and return to their previous set-point is a myth. Although the exact effects vary depending on the bad event, disability1, divorce2, loss of a partner3, and unemployment4 all have long-term negative effects on happiness. Unemployment is the one event that can be undone relatively easily, but the effects persist even after people become reemployed. I'm only citing four studies here, but a meta analysis of the literature shows that the results are robust across existing studies. The same thing applies to positive events. While it's “common knowledge” that winning the lottery doesn't make people happier, it turns out that isn't true, either. In both cases, early cross-sectional results indicated that it's plausible that extreme events, like winning the lottery or becoming disabled, don't have long term effects on happiness. But the longitudinal studies that follow individuals and measure the happiness of the same person over time as events happen show the opposite result -- events do, in fact, affect happiness. For the most part, these aren't new results (some of the initial results predate Daniel Gilbert's book), but the older results based on less rigorous studies continue to propagate faster than the corrections. Unfortunately, false claims about studies and evidence aren't limited to pop-sci memes; they're everywhere in both software and hardware development. I see something like this at least once a week. I'm picking this example not because it's particularly egregious, but because it's typical. If you follow a few of the big time FP proponents on twitter, you'll see regularly claims that there's very strong empirical evidence and extensive studies backing up the effectiveness of type systems. However, a review of the empirical evidence shows that the evidence is mostly incomplete, and that it's equivocal where it's not incomplete. Of all the false memes, I find this one to be the hardest to understand. In the other cases, I can see a plausible mechanism by which results could be misinterpreted. “Relationship is weaker than expected” can turn into “relationship is opposite of expected”, log can look a lot like an asymptotic function, and preliminary results using inferior methods can spread faster than better conducted follow-up studies. But I'm not sure what the connection between the evidence and beliefs are in this case. I can see why false memes might spread quickly, even when they directly contradict reliable sources. Reading papers sounds like a lot of work. It sometimes is. But it's often not. Reading a pure math paper is usually a lot of work. Reading an empirical paper to determine if the methodology is sound can be a lot of work. For example, biostatistics and econometrics papers tend to apply completely different methods, and it's a lot of work to get familiar enough with the set of methods used in any particular field to understand precisely when they're applicable and what holes they have. But reading empirical papers just to see what claims they make is usually pretty easy. If you read the abstract and conclusion, and then skim the paper for interesting bits (graphs, tables, telling flaws in the methodology, etc. ), that's enough to see if popular claims about the paper are true in most cases. In my ideal world, you could get that out of just reading the abstract, but it's not uncommon for papers to make claims in the abstract that are much stronger than the claims made in the body of the paper, so you need to at least skim the paper. Maybe I'm being naive here, but I think a major reason behind false memes is that checking sources sounds much harder and more intimidating than it actually is. A striking example of this is when Quartz published its article on how there isn't a gender gap in tech salaries, which cited multiple sources that showed the exact opposite. Twitter was abuzz with people proclaiming that the gender gap has disappeared. When I published a post which did nothing but quote the actual cited studies, many of the same people then proclaimed that their original proclamation was mistaken. It's great that they were willing to tweet a correction, but as far as I can tell no one actually went and read the source data, even though the graphs and tables make it immediately obvious that the author of the original Quartz article was pushing an agenda, not even with cherry picked citations, but citations that showed the opposite of their thesis. If you liked this post, you'll probably enjoy this post on how the effect of markets on discrimination is more nuanced than it's usually made out to be and this other post discussing some common misconceptions. Thanks to Leah Hanson, Lindsey Kuper, Jay Weisskopf, Joe Wilder, Scott Feeney, Noah Ennis, Myk Pono, Mateusz Konieczny, and P. Oscar Boykin for comments and corrections on this that resulted in some editing. And a response from the tweeter I quoted above: "Great article, though I do feel my (intended to be exaggerated and humorous) tweet is not the same as a popsci article headline.". Ok, fair enough. If that was friendly ribbing, then that's a bad example. I'm really thinking of claims like "not relying on type safety is unethical (if you have an SLA)", which, when pressed, often turn out to be even stronger than they initially sound. BTW, if you're going to send me a note to tell me that I'm obviously wrong, please make sure that I'm actually wrong. In general, I get great feedback and I've learned a lot from the feedback that I've gotten, but the feedback I've gotten on this post has been unusually poor. Many people have suggested that the studies I've referenced have been debunked by some other study I clearly haven't read, but in every case so far, I've already read the other study. Long-term disability is associated with lasting changes in subjective well-being: evidence from two nationally representative longitudinal studies. Hedonic adaptation refers to the process by which individuals return to baseline levels of happiness following a change in life circumstances. Two nationally representative panel studies (Study 1: N = 39,987; Study 2: N = 27,406) were used to investigate the extent of adaptation that occurs following the onset of a long-term disability. In Study 1, 679 participants who acquired a disability were followed for an average of 7.18 years before and 7.39 years after onset of the disability. In Study 2, 272 participants were followed for an average of 3.48 years before and 5.31 years after onset. Disability was associated with moderate to large drops in happiness (effect sizes ranged from 0.40 to 1.27 standard deviations), followed by little adaptation over time. Cross-sectional studies show that divorced people report lower levels of life satisfaction than do married people. However, such studies cannot determine whether satisfaction actually changes following divorce. In the current study, data from an 18-year panel study of more than 30,000 Germans were used to examine reaction and adaptation to divorce. Results show that satisfaction drops as one approaches divorce and then gradually rebounds over time. However, the return to baseline is not complete. In addition, prospective analyses show that people who will divorce are less happy than those who stay married, even before either group gets married. Thus, the association between divorce and life satisfaction is due to both preexisting differences and lasting changes following the event. According to adaptation theory, individuals react to events but quickly adapt back to baseline levels of subjective well-being. To test this idea, the authors used data from a 15-year longitudinal study of over 24,000 individuals to examine the effects of marital transitions on life satisfaction. On average, individuals reacted to events and then adapted back toward baseline levels. However, there were substantial individual differences in this tendency. Individuals who initially reacted strongly were still far from baseline years later, and many people exhibited trajectories that were in the opposite direction to that predicted by adaptation theory. Thus, marital transitions can be associated with long-lasting changes in satisfaction, but these changes can be overlooked when only average trends are examined.